Was Cantor selling his vote? Well, if he was, the people in Cantor’s district have sent him packing. Why? 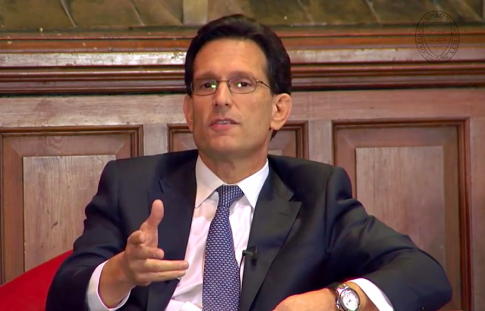 How do politicians like Cantor get elected? Don’t they promise to bring home the bacon? Don’t they promise to buy our votes with “other people’s money”? Sadly, the GOP has demonstrated that it is run by a pack of liars like Cantor. But the liars didn’t get there by themselves. They have been voted into office year after year, decade after decade by gullible voters. Our biggest problem always seems to be that guy in the mirror. We can fix everybody but him. We don’t! Only God can do that. We just pray for our nation and trust in the Lord with all our heart. God shed His grace on this country as the song goes, and we have His favor. We can repent and intercede for those who aren’t on board with that idea, but say it,speak it, and believe it anyway. Some of them ain’t so bad, but we have given all of them far to much power. So they weary us. Look up 1 Samuel 8. You will see why. and now this makes me even more weary as how are we to ever get a non repentant nation to repent??? Not our job. We just spread the Gospel and love (agape love) each other, even the unrepentant. We just don’t participate in the foolishness of the unrepentant. If God wants someone to return His love, then He is much more capable than we are. We can pray for a revival, but only our Lord can soften a stony heart. on an aside, Tom I could sit and listen to you for hours—your teaching and wisdom is rooted in truth and you offer is so freely and so simply and so plainly yet so honestly and so on point….. I am hardly that wise. I have read your posts. I doubt I have said anything you did not already know. We all all need reminders, and that is part of the reason we have each other. One of my favorites from the Bible is the story about the widow that Jesus pointed out to his apostles. Because she was a poor woman, she could only put two mites in the temple treasury. Yet Jesus said she had given more than all the others; she had given all she had. Relative to what is needed, we too have very little, but we can strive to give all we have. God will make it enough. Being raised in the Episcopal church, we never learned the Bible to the level as our neighbors across the street at the Baptist Church—my mother use to always threaten to send us across the street for Sunday school so we could learn a thing or two. I was raised as a Catholic. The Catholics have a similar problem. The priests, not the laity, are expected to read it. I am still a bit angry with the Catholic Church about that, but I have to admit I should have read the Bible on my own initiative. I had enough reason to do so. The way I “read” the Bible is I listened to it as I commuted to work. It took awhile, but I eventually looked forward to listening to the Bible, and it was the KJV too. In retrospect, I made a mistake. I would have finished the Bible years ago, but starting with Genesis and trying to listen to the books of the Bible in order is a killer. Genesis is okay, Exodus is not bad, but Leviticus, Numbers, and Deuteronomy one after another is too much. It works better to alternate between books from the Old Testament and the New Testament. I am luck I finally chose to listen to the Bible. The Bible was meant to be listened to, not read. So I suggest you find a good recording and try it. Also, if you have not participated in a Bible study group, consider doing so. I lived life in bible studies throughout high school plus joining Young Life, a national non denominational Christian youth group, and did so in college but not a dutifully. and if the truth be told Tom, I’d probably become Catholic if I liked the small church here better…. I believe Obamacare can and will be repealed,or at least seriously reformed and replaced. I believe President Trump is on it and in it to get it done, no thanks to several Republicans. Part of the reason why I believe that is that just a few weeks after he became president, our Obamacare fines were suspended pending farther legislation. He signed that in immediately,so he actually delivered,surprising the heck out of me,because as much as I like President Trump, he’s still a politician and they can be kind of grandiose and full of empty promises. He has delivered a few times now, in very tangible ways that have impacted our family.